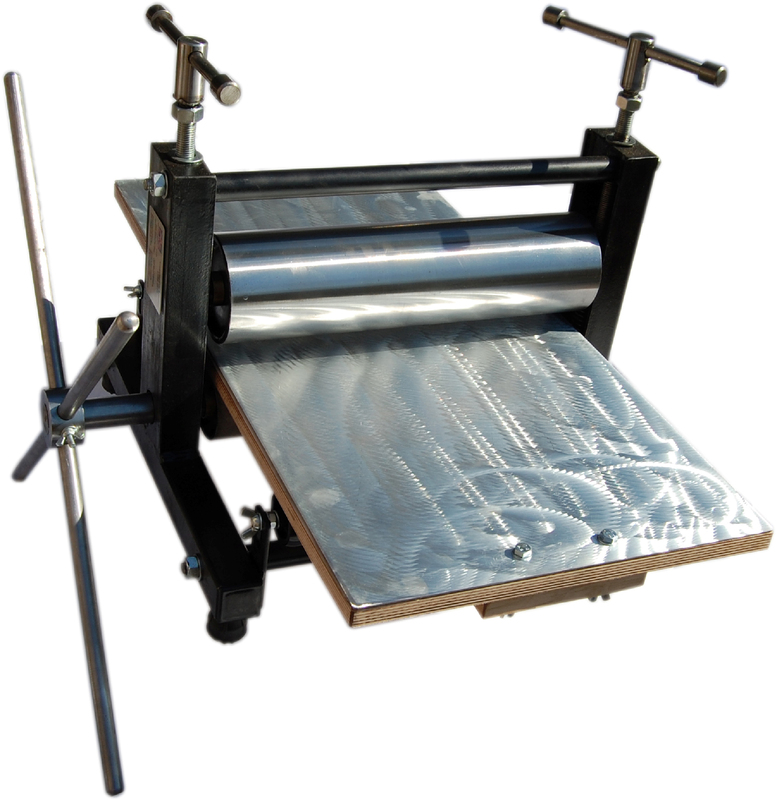 For the full specifications, prices and how to order the Gunningarts printing machines click here or call Jenny or Sarah Gunning on 01952434033 for more information. Printmaking touched me on the shoulder over thirty years ago and is still firmly sitting there. A lot of people I meet get grabbed by the many avenues printmaking has to offer. Obsession is a good word. I know from my own experience that the first pull off a new etching plate is nerve biting stuff because you can never be sure of what you are going to exactly find. college machines when I was part time teaching. I remember battling with a portable machine someone lent me , the prints made from it were poor and inconsistent. The next machine was a traditional Little John machine which never printed well. I discovered later that the printing bed had warped and I stood small chance of getting good results. A man at a London college suggested to convert an old mangle. I did this and do not recommend to anyone else. The side frame exploded when I put too much pressure down. I had had the rollers replace with steel ones but did not realise cast iron frames do not withstand the pressure needed to print an etching plate. The side frame that went bang just missed my head and imbedded itself in my wooden studio wall. What to do? I decided to give up printing for a time but started to make plates as art. My first large plate was a long one 12 x 55 inches in steel ‘The Ring of Brodgar Stone Circle’ I worked on this plate for weeks and weeks. Finally months later I wanted to print off it. I started to doodle and make plans of a printing machine I could possibly make. How to do this? I wanted to make a portable machine similar to the one I had used months before but I wanted it to be a multi printer which would be hands on and tough, very tough, to last a lifetime. I found an engineer who looked at my ideas and who agreed to make my design up. Two months later a very crude machine appeared but it worked well. I stared to print and make consistent work. Soon a friend asked where I had got the machine from as he would like one. My first machine sale was made and Gunningarts was born. The world of manufacturing was new to me and I had a lot to learn. I soon realised I was being ripped off when a friend visiting London saw one of my presses being delivered to a building near Westminster Bridge. I was stumped, what to do! Lets do it all myself I said but how. My garden shed studio became the headquarters and manufacturing base of my new machines. I went back to college part time to learn the various industrial trades. Welding, Turning and Milling. I picked up a lot myself and began making presses. Months went buy. I made contacts out in the West Midland industrial world and eventually found people to make my printing press parts. The advantage of becoming fluent with using various industrial machines resulted in the fact that I did not get ripped off any more. As time went by I gained respect from the people I engaged with. Also I found great locations inside factories to draw and print. Over the years I have changed parts and finely honed my printing machine design. I introduced different sizes of machines. Small portable ones, medium size and massive ones. I somehow managed to achieve my goal of creating a printing machine that does not rely on weight to print a very good etching My machines all print the same wether it is a ‘Little Thumper’ or one of my larger machines. My machines are multi printers not boring machines which only stamp or roll through. I introduced top springs so the the artist can easily adjust the height of the top roller. It is possible to print an etching one minute and a lino the next. No spanners! Everything is hands on and there is nothing to jam or break. I finally have dispelled the prejudice I had to put up with for years from pedantic printmakers who revere there machines more than the work made with them. My machines can get covered in ink, they can get abused but they are ‘hands on’ a young child of five can use one and older artists can easily adjust the pressure to print what the want. I am proud to have now established a family business with my wife and two daughters. We are practicing printmakers and not shop keepers and love what we do. I hope you like this very brief history of how it all started.